Use the Custom BiHAREAN BIOLOGIST's Google Search to find articles quickly! Both original research papers and reviews are welcomed. Review papers should deal with topics of general interest or of contemporary importance, being synthetic rather than comprehensive in emphasis. Authors of Review papers should consult with the editors before submission. Original research papers are welcomed both as full-length papers or short notes. The editors reserve the right to move manuscripts from one to other category. All manuscripts must be accompanied by the Cover Letter. This form must be completed and signed by all the authors before processing of the manuscript can begin. Please read it carefully! Before submitting any material, please read carefully our journal ethical and publication malpractice statement. In order to avoid any type of publication malpractice each submission must be accomplished by our journal sample “Cover Letter” signed by all of the authors. Until to sign the “Cover Letter” please read carefully the “Declaration” section at the end of the letter (above the signatures). The manuscript submitted must represents the author’s original work and has not been published and is not being submitted or considered for publication elsewhere (also see our “Cover Letter”). Submitting your paper for evaluation concomitant to other journals is unacceptable. In such cases the manuscript will be rejected automatically and all of the authors lose the right to submit and publish manuscript to/in the “Biharean Biologist” and to/in other, “sister journals” (“sister journals” means journals of the same publisher and related publishers with cooperation agreement). Also the editor of our journal will inform the editor of the other journal about the situation of the submitted manuscript. The authors need to ensure that the original data in their manuscript can be clearly distinguished by the one published in other scientific papers. The authors of the manuscript need to ensure that the text, illustrations, and any other materials included in the manuscript do not infringe upon any existing copyright or other rights of anyone (also see our “Cover Letter”). Papers with any type of plagiarism will be rejected automatically and the authors lose the right to submit and publish manuscript to/in our journal and to/in other, “sister journals”. In the case if the authors try to publish again an already published paper (being their own data or data of other authors) the editor of the “Biharean Biologist” will inform the editor of the other journal in which was published the original paper. 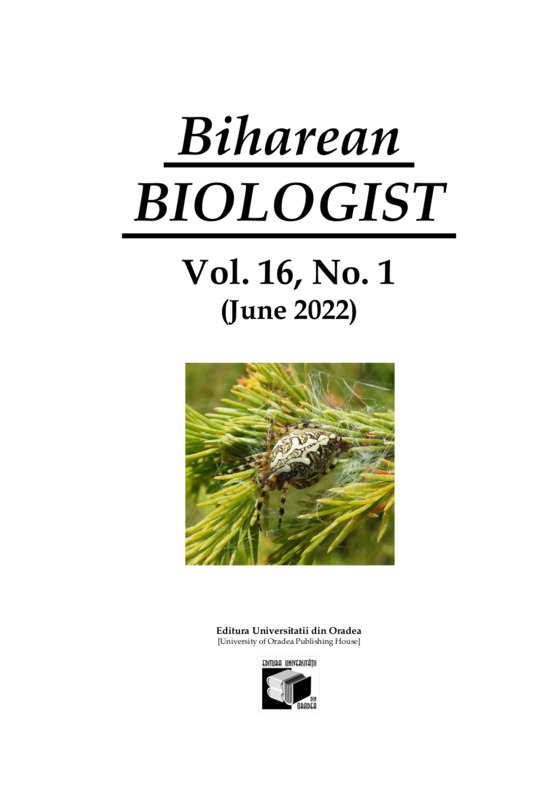 In such situations the editor of the “Biharean Biologist” also will inform the founding agency (in the case if exist), the institution, and also the reviewers. All authors listed in the manuscript need to meet the authorship criteria and all of them participated in the work in a substantive way and are prepared to take public responsibility for the work (also see our “Cover Letter”). All authors have contributed to the manuscript and that common agreement has been reached before submission (also see our “Cover Letter”). In other case the manuscript can’t be accepted for evaluation in order to be published in the “Biharean Biologist”. Our “Cover Letter“ in which appear all of the above mentioned ethical statements must be signed by all of the authors. Manuscripts submitted without the “Biharean Biologist”’s sample “Cover Letter” or with a not all author signed one, will be rejected. The authors of articles that are based on experiments that caused injuries or death of animals should explain and justify the grounds of the study and state that the scientific results of the study is at least in trade-off with the sufferings caused. In the Materials and Methods of the manuscript, authors should detail as precisely the conditions of maintenance, transport, anaesthesia, and marking of animals. When available, references should be added to justify that the techniques used were not invasive. When alternative non-harming techniques exist, but were not used, the manuscripts may not be considered for publication. The editors of the “Biharean Biologist” reserve the right to reject manuscripts without peer-review if they do not comply the author’s guidelines or are beyond the aim and scope of the journal. Each paper will be sent to at least two independent reviewers. If there are inconsistencies between the reviewers, a third reviewer will be asked to review the manuscript. The editor will decide the acceptance or rejection of the manuscripts according to these reviews. See more about publication ethics at the following links: EASE June 2012, EASE toolkit, and other materials from the EASE web page. Manuscripts must be submitted in electronic version only, as well as the original figures and tables. The manuscript text should be MS-Word processed, typed throughout in letter quality with font size 12, Times New Roman, without footnotes, without section breaks(! ), double spaced (about 30 lines per page), line numbered (do not use page numbers! ), on A4 (210 x 297mm) paper, with margins of at 25mm on each side. All pages should be numbered consecutively in the bottom, right-hand corner. For all types of papers, the title page must contain and only contain the following: title of paper (bold); name(s) of the author(s); address of the Institution where the work was done, and the name and address of the corresponding author with an email address. Provide a title that is concise but also an informative synthesis of the study. Where appropriate, include mention of the family or higher taxa. Please provide a short running title of five words or less. Key words: all of the manuscripts, including short notes must contain abstract and at least 5 key words. Short Notes (generally less than four-five manuscript pages) should be produced as continuous text, preceded by an abstract of no more than 150 words. Because the Biharean Biologist wants to promote research of current interest, the references must contain titles published in the past two years (including the submission year) in other leading journals. Word 2007. Unfortunately, the journal cannot accept Microsoft Word 2007 documents. Please use Word's 'Save As' option therefore to save your document as an older (2003 or later) *.doc file type. Color Figures: The editors reserve the right to decide what figures are justified and can be published in RGB color (another figures will be removed or published in black and white). 6. Table and figure captions following the tables and figures. Step 1. All of the registered manuscripts will get a MS number with the following formula: bb.YY.No. (YY-submission year, eg.10 for 2010; No.- the number of the manuscript in the above criteria). The editors will send you the registration mail in maximum a month. The authors must use their Ms number in the subject of any emails referring to their paper. The editor(s) will not answer to requests that doesn't respect this criteria. The e-mail subject must be some like: <<submission to BihBiol>> (not <paper>, <a title>, etc. ).